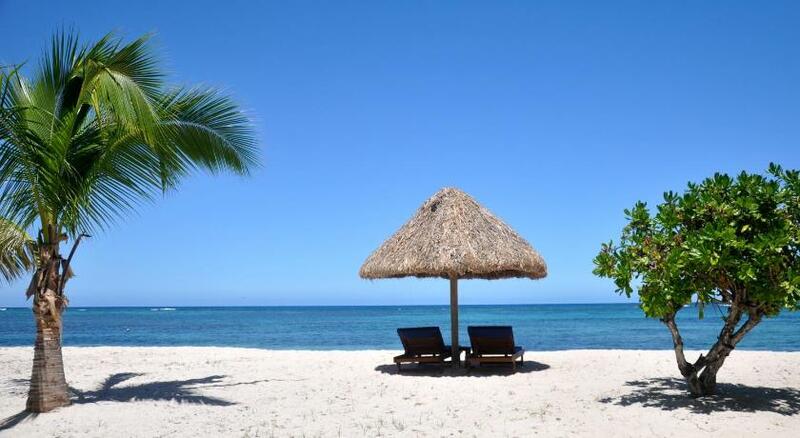 Tucked away in the Yasawa Island Group of Fiji you’ll find Viwa Island Resort. With just 11 bures located on the beachfront, the resort caters to guests 16 years and older. The resort is open for business again with a new look after suffering damage from TC Winston late February. It opened its doors again on July 9 with newly designed bures, a new Fijian-style bar and a quiet area for guests to relax, and more. The updated bures are now filled with more light and updated with a fresh color palate. There are two types of rooms at the resort and they are both situated beachfront. It just depends on whether you want one bedroom or two bedrooms with additional space. There are eight one-bedroom Deluxe Beachfront Bures and three two-bedroom Executive Beachfront Bures. They are all crafted with traditional Fijian materials. You’ll find each has indoor/outdoor bathrooms and a private patio overlooking the ocean with lounge chairs. The two bedroom bures are very spacious with a larger sofa and living area. Viwa will soon open a new massage bure which will offer manicures and pedicures (for now guests can still have a massage on the beach!). Guests will also see a new look in the main bure with a beautiful display of tapas on the main bure ceiling and traditional Fijian weaving around the beams. Guests will also enjoy a new bar with beautiful solid wood grain and reception area. And while sampling the Fijian cuisine of the resort, guests will now be able to see the chefs hard at work with a new open kitchen. The lagoon in front of the resort is perfect for snorkeling and kayaking. The resort offers plenty of water activities like diving and deep sea fishing excursions. For the divers, visibility is over 30 meters at all of the resort’s dive sites and guests can use the resort’s new equipment. There are dive spots near the resort for beginners as well as experienced divers (at most 25-minute boat ride). If you are lucky, you may meet one of the owners of the resort during your dive – one is a resident dive instructor and another is a qualified divemaster. If you are into deep sea and reef fishing, Viwa has three different boats equipped with a combination of deep sea and reef fishing. Since commercial fishing is not permitted in the fishing area near the resort, fish are abundant. They have seen tuna, Spanish mackerel, giant trevally, dorado, and red snapper. And make sure you get immersed in the fascinating Fijian culture with any or all of the activities the resort offers such as a kava ceremony, fire dancing, village visits, school visits, history hike, cooking lessons, playing village rugby 7’s (during rugby season only), basket weaving, and coconut husking. At Viwa you’ll find seclusion from the world yet beauty to revel in at your leisure pace – and now with many new upgraded features to enjoy!